Why might you want your favorite apps recoded into Microsoft’s UWP format? According to one Microsoft executive, it's because your app will help your PC run more efficiently over its lifetime. Longtime PC owners often refer to “bit rot”—the general slowdown that affects PCs as they age. “You probably notice that on day one, when you buy a brand new PC, it’s really fast,” explained Jason Ronald, the principal group program manager of Microsoft Game Studios. “It boots fast, it logs in fast, it’s just really fast." Over time, however, it just gets a little bit slower. "A big part of that, especially on the boot time," Ronald continued, "is what people refer to as ‘registry bloat.' That’s because each time you load a traditional Win32 .EXE application, the registry file within a PC grows and grows." It doesn’t matter whether you’re actually running that app. Each time you boot your PC, that registry file gets loaded. Processing those registry entries helps contribute to the inefficiencies that, over time, render a PC less and less usable. Uninstalling apps never gets rid of everything, either. UWP apps won’t be subject to those same limitations, meaning that, according to Microsoft, your PC should “feel fast” for longer. The story behind the story: Until now, Microsoft’s argument for using UWP apps was that they’ll run on tablets, PCs, phones, the HoloLens, and the Xbox One. Now, Microsoft appears to be making the case that UWP apps will improve basic PC use. “Centennial” is the name Microsoft has given to the converter or bridge between existing Win32 apps—the traditional .EXE files of just about every app on a Windows PC—and the new .APPX format of the Universal Windows Platform apps, the format the company is pushing developers to use for Windows 10. The idea behind Centennial is that developers should be able to take their existing Win32 apps, run them through Centennial, and end up with a UWP app. Ronald and a colleague took Evernote’s Win32 app, performed the conversion, and ended up an .APPX version just a minute or two later. According to Ronald, UWP apps also have their own identity, which means they can be assigned their own Live Tile and issue notifications via Windows 10. The other big advantage that should appeal to developers and consumers alike is the fact that the apps can be easily packaged and sold on the Windows Store, Hilwa said. It’s easy to see why Microsoft and developers would like to see this scenario come to pass, as the Windows Store could become the app superstore it should be. Think of DOOM and Wing Commander repackaged as UWP apps, sold alongside software from Autodesk and Adobe. 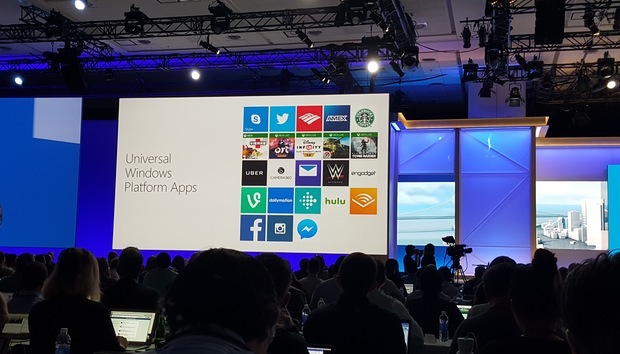 Clearly, Microsoft believe UWP apps will be the future of Windows 10. It's too early to tell, though, whether developers and consumers will buy in.